Keeping a Betta fish is one of the more colorful experiences in the fish keeping world but it can also be particularly challenging. Unlike other pets, keeping a Betta fish can be frustrating because your fish cannot communicate its needs. There are a number of common Betta fish diseases. Find out how they can be identified and what should be done to treat them. There are a wide variety of Betta fish diseases and while it may seem to the untrained eye that the symptoms of these diseases are similar, often times they can be distinguished when you know what you are looking for. Becoming educated in regards to the health of your Betta is one of the biggest steps that you must take in order to ensure that your fish remains healthy. Something else that is just as crucial however, is timing. Knowing what to look for when your Betta fish is feeling under the weather is important but so too is having the appropriate medications on hand in order to treat your Betta as soon as possible. Many of the common Betta fish diseases are fast-moving and it is important that once you ascertain that your Betta is in need of medical care, that you have the appropriate treatment on hand in order to stop the progression of the disease in question. Timing is everything when it comes to treating any Betta fish disease. Like most pet owners you are likely to already be attached to your Betta fish which means that you are prepared to care for it like you would any other pet, this means that you should always have a first aid kit handy for your fish. It may sound absurd to create a first aid kit for a Betta fish but the truth of the matter is that the medications most often required to treat Betta fish diseases are not available in most pet stores. If the time comes that your Betta fish is ill we have already discussed the importance of timing and this means that mail order medication for your fish’s treatment may take too long to arrive in order to treat your fish before it expires. As a responsible Betta fish owner you should always have a basic first aid kit available to treat the most common Betta fish diseases. What Should Be Included In A Betta First Aid Kit? BettaZing and BettaFix are anti-parasitic, anti-fungal and anti-protozoan medications that are great when used as a preventative medication to prevent the development of clamped fins or velvet fins. This medication should be applied as a preventative measure any time you acclimate a Betta to a new environment or anytime you add a new Betta fish to your tank. Most top of the line fish stores will carry Kanamycin, an antibiotic that is most commonly used for more serious bacterial infections that your Betta fish may contract. Tetracyclin is available from a number of pet stores and is also used as an antibiotic to treat bacterial infections. Where Kanamycin is used to treat more serious bacterial infections, Tetracyclin is used more often for less serious bacterial infections. Ampicillin is another antibiotic worth carrying in your Betta fish first aid kit and is available in specialty fish stores as well as online. Ampicillin is used for gram positive infections, some gram negative infections and pop-eye. Jungle Fungus Eliminator is an anti-fungal treatment that can be purchased online or from fish specialty stores. This treatment is generally used for a number of fungus infections and is particularly useful to keep on hand for any Betta fish owner. Maracin 1 and Maracin 2 come in hard tablet form and are both anti-fungal and antibiotic treatments. These medications are utilized when your Betta fish has contracted a mild infection like fin rot but they are not as effective as some of the other medications listed when it comes to the more serious infections. Chris Simms from Aquatic Central in San Francisco, CA, explains how to treat a sick Betta fish. You need to identify the illness (fungal ailment) and administer a treatment (curing the fungus). The first step in treating any Betta fish disease is to recognize when a Betta fish is sick, this can be particularly difficult due to the limited communication that Betta fish can provide to their owners. A fish that stays at the surface of the water in the corner of its tank. A fish that lies at the bottom of the tank and only comes to the surface to breathe. A fish that does not eat, does not show an “excited” reaction to being fed or a fish that spits out its food. It should be noted that some Betta fish pellet food can come in pellets that may be too large for your Betta fish, a healthy Betta may spit these out and wait for them to become soggy before trying to consume them a second time – this does not indicate a sick fish. A fish that appears to have “lost” its color or appears to be a much less vibrant colorful shade. A fish that appears to be scratching itself by rubbing against items in its tank. A fish that appears to have unusual sores or markings on its body that were not present previously. A fish whose tail or fins are no longer spread out and have the appearance of being unhealthy, closed or clumped together. A fish with gills that do not close completely due to inflammation, inflammation can also cause the gills to appear red in color. A swollen stomach or “hollow” appearing stomach. Raised scales that give your Betta the appearance of having a prickly texture. A Betta fish that exhibits any of these signs should always be isolated from any other fish if it is being kept in a community aquarium because a number of common Betta fish diseases can be easily communicated from one fish to another. Having a disease pass from one fish to another is not only unfortunate for the fish involved and more expensive to treat but it is also a way for the disease to be contracted a second time by a fish that has already been effectively treated. If you have a Betta fish that has become ill that is kept in a community tank make sure that you do keep an eye on other fish in the tank for any signs of the disease in question being contracted by them. ALWAYS wash your hands with an antibacterial soap if you handle a fish that has any type of illness or disease to ensure that you do not spread the disease from one fish to another – not to mention that this is the sanitary thing to do whenever you handle your fish. Only a licensed veterinarian or fish expert can identify particular Betta fish diseases accurately in order to treat them; however, a number of Betta fish diseases are so common that they can be readily identified by someone who has experienced them before or knows what to look for. With that said however, this information should not be taken as professional advice or utilized for diagnosis to treat a sick Betta fish. A fish with fin or tail rot will exhibit a variety of symptoms but the most obvious are clumped fins or tail tissue or fin or tail tissue that appears to be disintegrating and disappearing little by little. This type of Betta fish disease should be treated with Ampicillin or Tetracycline and your Betta fish tank should be thoroughly cleaned and clean water should be used in the new tank. Ensure to treat the new water before filling the tank. A fungus eliminator should also be utilized in the new tank to ensure that your Betta begins recovery. It is important to be consistent with tank cleaning and water change when treating fin or tail rot, this should be done once every three days or so with medication being added with each water change. Once your Betta fish no longer shows signs of losing tissue on their tail or fins and begins to show signs of new growth you can resume a normal tank cleaning schedule. Ich may sound funny but there is nothing funny about this parasite! This parasite is most commonly contracted by your fish through frozen live food and most commonly presents as small white dots on your fish’s body, head, tail and fins. Ich can be prevented by ensuring that you add a small amount of aquarium salt and Aquarisol to your Betta fish tank when maintaining your tank; however, if your fish does contract this parasite it should be treated quickly. Fishes with ich not only present with small white dots but they also appear to be scratching themselves against items in the tank and may become less active than normal. Ich is an extremely contagious parasite and if one fish in a community tank has it there is an extremely high likelihood that other fish have it or will develop it so you should always treat the entire tank. Ich is most commonly treated by raising the temperature of the Betta fish tank; however, this can only be successfully done in tanks lager than 5 gallons since smaller tanks can quickly overheat killing your Betta fish. In larger tanks, temperatures of 85 degrees will quickly kill off the ich parasite. If heating the tank is not an option because of a smaller tank you should completely clean your tank, replace all water in the tank and treat with Aquarisol and aquarium salt. It is also commonly recommended to put your Betta fish in a holding container after cleaning the smaller tank and raising the temperature of the water to 85 degrees to kill any remaining parasites without risking overheating your Betta fish. Fungus is common in tanks that are not treated with salt and Aquarisol when water is added. Once a single fish in a community tank contracts a fungal infection there is a high likelihood that another fish may also contract the fungal infection so it should be treated quickly when spotted. Betta fish that have fungal infections can appear to be a much more pale hue of their normal color, they may not be as active as they usually are and their fins may have a clumped appearance. A fish with a fungal infection can have patches of a white cotton-like appearance on their body. Eliminating fungus should begin with a full water change and treatment of the new water with a fungus eliminator, this type of medication will cause the water to change to a gold-like color, this is normal. Every three days the water in the tank should be replaced and a new dose of fungus eliminator should be administered. Once all visible signs of the fungal infection have disappeared ensure that you treat your tank with BettaZing or Bettamax to treat any trace signs of the fungal infection that may remain. Popeye is one of the more noticeable diseases in Betta fish because as its name suggests, a fish with this disease will appear to have one or both eyes protruding from the head. Most commonly popeye develops from dirty tank water because it is a bacterial infection; however, popeye can also be the result of a much more serious illness. Most commonly when popeye does not respond to treatment it is a symptom of a much more serious disease like tuberculosis which is incurable and your Betta fish will be unable to survive. For the fish that has contracted popeye as a result of dirty tank water however, treatment can quickly remedy the bulging eyes that result from this disease. Treatment for popeye should be immediate in order to prevent any long-term damage or loss of sight in your fish. To treat popeye clean your tank and do a complete water change and add Ampicillin to the clean water. Clean water should be changed every three days and medication should continue to be added until one week after your fish’s popeye symptoms disappear. Advanced fin and body rot is a case of regular fin rot that goes on for far too long. When regular fin rot is not treated or when it progresses extremely quickly it can be extremely difficult to stop. A fish with this disease will experience a loss of fin and body tissue as the rot progresses. Once the rot progresses on to body tissues there is very little that you can do to help your fish as the bacteria quickly eats your fish alive. In cases of extreme fin or body rot you may begin to see small bones protruding from your fish’s body. If the affected fish is not treated in time they will die quickly but this death likely causes the fish to suffer a lot of pain. It is occasionally possible to control the progress of advanced rot and the fish can continue to live while being treated. Stopping advanced fin and body rot is difficult and you will need to completely change your fish’s water and combine a number of medications designed to treat fin rot. In cases of severe rot you may want to over medicate the water and then continue cleaning your fish’s water every three days adding new medication each time. Once your fish shows new growth in the fins and on the body you can switch to a medication designed to prevent bacteria from growing in the water again. Velvet is a parasite that can be prevented completely by adding aquarium salt and water conditioner to your fish’s tank. Velvet is particularly contagious and if you have shared aquarium nets between tanks and have a case of velvet, you will want to ensure that you treat all of your fish for velvet. Velvet is completely treatable but it can be difficult to see in your fish. In order to check your fish for velvet you will want to shine a flashlight on your betta and if they have velvet you will see a fine mist over their body that looks gold or rusty in color. Betta fish that have velvet will clamp their fins to their body, will lose its color, will not eat normally and they will scratch against the gravel of the tank. Velvet is a parasite and it can be treated. If you have a number of fish in a tank and one shows signs of velvet, it is best to treat all of the fish due to how contagious velvet is. A medication called BettaZing is effective at eliminating velvet completely. 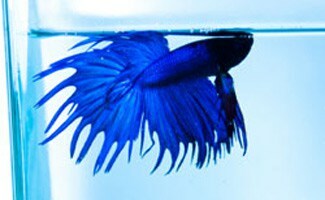 Dropsy is seen often in betta fish and it is particularly fatal. Dropsy is most often contracted through the feeding of live food. Not a lot is known about dropsy other than the fact that it comes from feeding contaminated food. A betta fish with dropsy will present with raised scales as a result of a buildup of fluid underneath the fish’s scales. The buildup of fluid is the result of kidney failure and just as with any animal, once the betta fish’s kidneys fail, the fish will die. The bacteria that cause dropsy are very contagious and it is these bacteria that cause kidney failure. Spotting dropsy in your betta fish is relatively easy, your fish will have puffed out scales that look similar to pine cones and it may also appear to have a big bloated stomach. There really is no known cure for dropsy but a good preventative is to avoid feeding worms to bettas. It is important if you have a betta that presents with dropsy, that you keep it away from other fish. Swim bladder disorder is not contagious but it is a common illness among betta fish that comes as the result of overfeeding. Young bettas and double tailed bettas are susceptible to this illness. The swim bladder of the fish is located between the belly and the spine of the fish. When the betta fish has a swim bladder that is too short they will not be able to swim horizontally. When a betta fish has a swim bladder that is swollen they will float on one side. Many times when fish have shorter swim bladders they will prefer to lie at the bottom of the tank because swimming is too difficult. 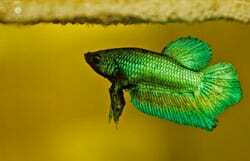 It is possible for a betta fish to contract external parasites in the pet store or from the foot that they are being fed or from other fish being introduced to the tank. It is usually possible to see parasites by looking closely at your fish. In the case of some parasites like anchor worms, you will have no problem spotting them. A fish that has external parasites will show symptoms of needing to scratch itself against anything it can find and it will not behave as it normally would showing signs of being uncomfortable in its tank. If your betta fish shows signs of external parasites you will want to change out 70% of your fish tank’s water. Changing out a percentage of your fish’s water will help to reduce the population of the parasites and their eggs but it will not remove them all completely so it is important to treat the remaining water. After replenishing the water you will want to treat it with BettaZing, a product designed to clean the water and kill the remaining parasites and their eggs. This infographic made by The Aquarium Guide summarizes many of the the items above as well as some additinonal solutions for how to help with your Betta’s diseases. Prevention is the most important part of Betta fish diseases because prevention is much easier than treating or trying to cure Betta fish diseases. Most Betta fish diseases require a large amount of work in order to save your Betta fish from succumbing to the disease that they have contracted, most often this involves cleaning the tank and replacing your Betta’s water once every three days in addition to the application of medication. In most cases Betta fish diseases are easily preventable by maintaining a clean tank and feeding a healthy diet. There are, however, occasions where a Betta fish is purchased with a pre-existing disease or condition and in this case treatment is required in addition to taking preventative measures in the future. It is important to note that while prevention is the preferred method of “treatment” it is not always possible but purchasing a Betta fish with a pre-existing condition does not mean that your fish is doomed to die. As it has already been mentioned, the majority of these diseases are completely curable when treated appropriately and often times purchasing the fish that appears to have a pre-existing disease may be the only chance it has at survival. If you feel up to the challenge of Betta fish first aid, why not give a sick Betta a chance and put your fish doctoring skills to work! Learn more Betta fish facts and how to choose the right aquarium for your Betta fish. Is your Betta fish showing signs of sickness? Maybe someone else’s Betta is experiencing similar symptom’s and you can get answers and advice below. NOTE: While we have provided some information about common illnesses, we are not a certified fish doctor, so if you are experiencing issues with your Betta fish please contact your local pet store or seek professional help. As Tiffany indicated below, my betta has a large whitish spot on his lower fin. I have owned my fish for over a year with no problem until now. I believe his fin may have been damaged whe attempting to remove him to clean his 3 gallon bowl. I have used Bettafix several times, and he is getting worse. The directions say to put 18 drops per quart of water and not to change the water for 7 days. I bought a floating log for him to hide in whenever he wants. Now he stays in it. He doesn’t swim around in the bowl. He looks faded as well. I never owned a betta before. Any ideas on what I should do now? Thank you for a response! My betta fish has fin rot and it is quite serious. I’ve been treating him with Melafix, but it just keeps getting worse. This morning when I woke up he was fine but now his middle fin was worse and had red at the tips. He also looks like he has ick. Please help me I’m desperate I care about him very much. He is a veiltail. My Beta, has been losing scale on the top of his head and has an inflamed gill, does anyone know how to properly treat this, I can not seem to find exactly what this illness is. Many websites mention fin rot, pop-eye, etc. but none have the symptoms that my Beta is showing and I am unsure whether I need to treat it as a bacterial, fungal or parasitic illness. Hi ive had my betta for 5 months and recently shes been staying at the bottom of the tank. she’s still excited by food but her “scales” on her body are also shedding. could someone tell my whats wrong? thanks. My Beta also has shown physical signs of illness such as shedding scales and inflamed gill but is still excited for food and play times. Did you by any chance discover what was wrong with your Beta? I ordered antibacterial and fungal treatments but I am not sure which one I actually need to use. Hello. Our Betta, Jasper, was bloated last week and swimming funny. We read about the thawed, frozen pea treatment, but since they sink… how do you feed it to your fish?? Ours only eats floating food. Second problem – 5 days later and he appears to have fin rot. Will purchase medication tomorrow. Are the two incidents related? Also, can Plecos live with Bettas? Our small pleco seems to be stressing Jasper out. Yes your pleco can live with your betta. As long he/she doesn’t grow then you won’t need a bigger tank. The pleco will stay out of the betta’s way since betta fish never go to the bottom of the tank. My male betta fish has a single protruding relatively large white spot on his side and I was wondering if someone could tell me what it is and what specific product, possibly from the ones mentioned above, I could use to treat it. The fish is three years old and isn’t extremely active but does swim a lot from time to time when not resting and also eats normally. I bought a beta 5 days ago from a fish store. This morning he was laying on the bottom & has white patch on its body . I have some microbe lift natural expelling for bacterial disease that I put in the tank . I will do that for the next ten days . Any other recommendations ? Should I take some water out & put new treated water in . ? I have a male beta, only owned him for about a month. This morning I noticed his gil stuck open on one side. I dont see any parasites, he is eating, and swimming around , not trying to hide or anything. Seems agitated though. He can flare just fine but one side just wont close all the way. It does look a little red but being that he has lots of red on him I’m not entirely sure if it’s natural. Any suggestions or info that might help? My Betta has been home for about two weeks. I have him in a 2.2 gal tank with a plant and a house in it. He spends almost all his time glass surfing, and I turned off the filter because it seemed too powerful for him/to stress him out. I’m worried he has fin rot as one of his fins is shorter and more jagged than the others. Additionally, the small find right by his gills seem almost translucent. However, he is not lethargic at all and still eats readily. I have two bettas, both are sick with different symptoms. 1. The first fish has symptoms of labored breathing, darting, slightly yellowing, lethargy, and ‘falling’ when he’s resting at the bottom of the tank, and resting vertically at the bottom. 2. The second fish has a faded dark coloring, floats and turns to the side at the top of the water (almost looks like he’s dead), labored breathing, and hides behind his heater. They both have no trouble with eating however. Can anyone suggest what might be wrong and how I can help them? I’ve been trying to treat them for forever now and everything is so confusing and I can’t get them to get better. I have had my betta for about four months and a couple days back I wasnt at home so my mom fed my fish ,she over fed him so he was bloated ,I fasted him till it went down ,but now I cant feed him as much as I used to because he will bloat ,why? So we had our male betta fish for a couple days, and I always noticed that he would stay in the corner and looks discolored. Every time I go to school, my dad turns off the heater and the filter saying “its a waste of electricity”. The tank drops like 10 degrees Fahrenheit by the time I get home and turn everything back on. Could the temperature drops be the reason he’s like this? That is terrible for ANY fish. Please tell your father that he is essentially killing your betta fish. Bettas can do fine without a heater if they are kept in a warm room and the water temp doesn’t drop below 72. From my experience. But idealy they need to be in 74-80 degrees. But overall no fish can go through constant temp changes like that. I don’t have a link off hand. Just Google the water temp for bettas and please show him. They are tropical fish. Yes defentify! The temperature should be stable at all times. Then heater should not be turned off in the aquarium for that long and the temperature should not be dropping like that daily. It cause your fish a lot a stress, and be susceptible to getting diseases. The temperature drop can also cause shock to your fishy which can lead to death! Overall its just really bad for the betta fish the filter is not as important, you should tell your dad that the heater needs to be kept on at all times! Please keep the heater on at all times. The electricity it uses is very small, costing pennies per month. Hi Everyone, I left my male beta under the care of my father for 6 months. The day before I came back he started being super lethargic, isn’t eating, seems duller in color, and is laying at the bottom of the tank most of the day. How should I go about treating this? I already tried feeding him peas and he won’t bite at any food. Please help! I have a male beta and he was doing great however a few days ago I realized that he was swimming funny. Almost as if he was bent in half and then he tried to swim after it. He also has a large dark spot on his side that was definitely NOT there a week ago. The spot if rapidly getting bigger and has migrated to his other side within a day. I don’t know what else to do and I desperately want to help Joey before it’s too late. He still will eat just fine. He has opted for resting in his gummy plants a lot more now though. Please help I have no idea what to do and I’m desperate! I have a male beta and he’s always been great until recently I realized that he was swimming really weird. Almost lie he had bent in half and was trying to swim after. Also he had a very large rapidly growing dark spot on his side that was definitely NOT there a week ago. Since yesterday it has already migrated to part of the other side of his body. He still wants to eat so that’s not a problem but he isn’t getting around well and is choosing to sit in his gummy plant a lot more often. Please if anyone has answers I need them!!! Hello have you had any luck with your betta? It sounds like he could be constipated. Epsolm salt can fish that. But in general using any of the above treatments is worth trying. Get epsolm salt, aquarium salt. Betta fix. Stress coat. All in pet stores. I just recently moved my Betta with me to college about a few months ago and he was perfectly fine and happy when he got here but recently all he does is sit at the top of the tank in the corner and barely eats. my betta fish doesn’t seem to be showing any signs of these disease listed other than he just isn’t as active and tends to lay at the bottom of the tank but will show excitment to feeding and when I come over to the tank. he still does swim around the tank on his own just doesn’t do it as often as he used to. Just wondering what this could be of if it is just old age and hes slowing down. Can I use amoxicillin for pop eye? I cannot afford ampicillin right now, as I have lost my job. It is quite expensive. However, I have a brand new bottle of human amoxicillin. It is 500 mg capsules that are easily broken open. If I can use this, what is the dosage? It is one beta fish in a 1.5 gallon tank. I just purchased a 5 gallon tank but haven’t moved him yet due to the pop eye. I don’t want to add any stress due to the new tank. Does anyone know what causes Betas to suddenly die and loose all pigmentations? My fish Young Nickel slowly stopped eating the amounts he used too. I fed him last night, and today I went to feed him and he has passed. He was a dark red fish but when I found him he was nearly all white. He has a 5 gallon which I recently (a month ago) put two suckers and a moss ball with him. I tried giving him a different kind of food which I also tried with my other Beta Nick Klaus. Klaus is fine but the snails in his aquarium also died. I am not sure what is wrong, they have separate aquariums, I change there filters out frequently, also the water, I even put water conditioner in there. Any info given would be much appreciated. They lose their pigmentation as a result of dying. I don’t think it’s related to why he died. All they do fish die and then lose their coloring. They lose their pigmentation as a result of dying. The life span of a betta is 5 to 6 years. If the betta was full grown when you bought it, itcwon’t live as long. Many commercial pet stores sell full grown bettas. I bought mine from a private owner shop, and the bettas were small. Talk to the owner about how old the bettas are. Hope this helps. our Beta at work has the same issue. I didn’t think i noticed it before. Does anybody have any info on this issue? Hi, I believe my fish has internal parasites. She is very bloated and is not pooping. She wouldn’t eat a pea, and fasting did not work, so I am using a product called microbe lift herbtana. It’s very hard to measure since she is in a one gallon tank due to her having trouble getting to the surface. Anyways the reason I believe it is internal parasites is prior to this her poop was long white almost clear strings while in her 3 gallon tank. And I even noticed a small white string hanging from her. My question is, should I be doing water changes every day so the water doesn’t get overloaded with this medicine since I’m using it everyday(three days so far and no progress)… and secondly is there a better treatment method I can/should be doing for her? I’m getting so frustrated. Wish I could load a picture so you all can see her but she is huge in her middle. I don’t think it’s dropsy bc she still wants to eat and will still follow my finger if I pressure her long enough. Please help me if you have any suggestions or treatment methods. Thanks!